Address: Avinguda Princep Benlloh, 20, Andorra-a-Velha (Andorra la Vella), Andorra. Situated 200 metres from San Esteve Church, Hotel Pyrenees offers free Wi-Fi and a tennis court. In summer, guests can enjoy the outdoor swimming pool and terrace. 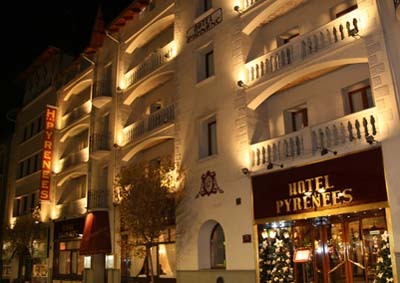 Hotel Pyrenees is located in historical central Andorra La Vella and close to its main shopping area. It is 7 km from both Grandvalira and Vallnord Ski Resorts. The hotel offers free ski storage. Rooms at the Pyrenees have simple, traditional décor. Each heated room includes satellite TV and a private bathroom. Air conditioning is available in the summer months. The hotel’s 1940 Restaurant serves fresh market cuisine. The varied breakfast buffet includes fruit juice, coffee, cereals,yoghurt, cold meats and cheeses. There is also a café-bar open all day long. A private on-site parking is available at an extra cost. Guests are required to show a photo identification and credit card upon check-in. Please note that all Special Requests are subject to availability and additional charges may apply. Please inform Hotel Pyrénées in advance of your expected arrival time. You can use the Special Requests box when booking, or contact the property directly with the contact details provided in your confirmation. Restaurant is closed from Mon 22 Apr 2019 until Thu 09 May 2019 Swimming pool is closed from Tue 30 Oct 2018 until Fri 31 May 2019 The hotel reserves the right to apply special cancellation policies to bookings made more than 2 months in advance. Please note that drinks are not included in half-board or full-board meal plans. All the rooms and common areas have air conditioning during summer time. The free WiFi connection has a limited speed. If you need a higher speed, you can ask at the reception for an extra cost. The outdoor swimming pool is located in an adjoining building, on the rooftop. One child under 8 years old stays free of charge in a child's cot/crib upon request only in the Double or Twin Room. On December 24 and 31 we do not offer regular half-board service. Half-board can be made only at midday, while the dinner service, on the 24th there will be a supplement that will vary according to the dishes chosen from the menu, and on the 31st a unique menu will be served with a supplement of 100 €.